Note: All graphs issued with e-malt.com newsletters are published in "Graph" section of e-malt.com site. All e-malt.com tables are published in e-malt.com Statistics section. The Statistics section includes Barley statistics, Malt statistics and Beer statistics. The tables related to barley are published in Barley Statistics section, the tables related to malt in Malt Statistics section and the tables related to beer in Beer Statistics section. Register a new user (free of charge). Go to login form (username and password are required for paid or flash subscribers). Edit your account: You can edit your registered data and change your username and/or password from a page with an editing form, which needs your current username and password! Have you forgotten your username or/and password? You can get your username and password by e-mail. If you need to change only your username and/or password, please type in your current username and password and the new username and pasword! E-malt.com Newsletters Archive could be found directly on e-malt.com site. Browsing through our Newsletters Archive you may see all the issues you have missed. To this purpose you just have to login e-malt.com and click on Newsletters link in the menu. Reading our Newsletters you will be kept informed with the latest news and events regarding malting and beer world. You may also submit your own news, events or other information to the address info@e-malt.com! 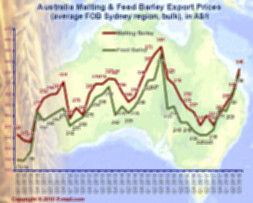 You may find updated malt, barley and beer statistics on e-malt.com Statistics section. 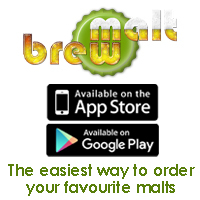 Just enter e-malt.com! Here you will find all tables issued with e-malt.com newsletters. If you have received this newsletter from a colleague, you can obtain your own subscription here! You are not registered yet? You may register here. You may recommend our site to your friend by clicking here. 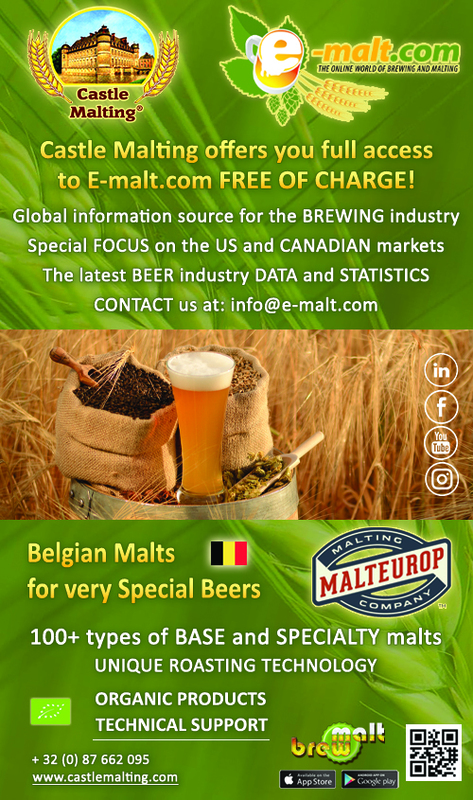 If you do not wish to receive our newsletter, please unsubscribe your e-mail address from our mailing list by sending us an e-mail info@e-malt.com. Please take into consideration your registration data. Please take into consideration your registration data. WHERE DO THE IBUS GO? A very good overview about IBU development during brewing was presented by the Research Team of Ballast Point Brewing. Although the measurement of IBU does not reveal specifics about the measured components (be it Isohumulones, alpha acids or humulinones) to measure IBUs throughout the process is an efficient way to get to know your hop processes better. Some findings are not surprising but important for efficient brewing. The bitterness utilization decreases with increasing hop rates and increasing original gravity values. Utilization increases with higher pH values. Based on IBUs and depending on bitterness level utilization values in the whirlpool can vary between 8-45%. Spirits giant Diageo is taking a deeper plunge into bourbon and American whiskey production with plans for a new distillery in Kentucky, the Courier Journal reported on December 14. The $130 million venture includes plans to build a distillery and warehousing on an approximately 144-acre site at Lebanon in Marion County, the company said Thursday. Diageo officials said the goal is to start production in 2021. The company whose brand lineup includes Bulleit bourbon is hoping to increasingly tap into the popularity of American whiskeys. "Bourbon and American whiskey are vibrant and growing categories and we are excited to expand Diageo's footprint in Kentucky to support our ambitions in this space," said Barry Becton, a senior executive at Diageo North America. Global trade disputes, however, are threatening to dampen the good times for American whiskey makers. Those disputes have resulted in tariffs slapped on bourbon and other American whiskeys in some key overseas markets, including the European Union — where Kentucky spirits producers exported nearly $200 million of their products in 2017. Downtown Muskegon’s third brewery is coming, MLive.com reported on December 14. Rake Beer Project, owned by Muskegon-born brewer Josh Rake, recently signed on to be part of a new development in downtown Muskegon. The brewery is one of four businesses that will take up residence at NorthTown 794, which is expected to open during spring 2019, said building owner and Muskegon-based entrepreneur John Essex, of Core Realty Partners. NorthTown 794 is the reincarnation of the century-old former Al Perri furniture store at 794 Pine St. Built in 1923, the building is being restored to its former 1920s glory with the goal of contributing to the rapid redevelopment and rebirth of downtown Muskegon. The brewery and taproom will occupy the garden level. The historic building is “absolutely beautiful,” said Rake, a 2010 Mona Shores graduate who plans to move back to Muskegon to open his brewery. Muskegon is a good fit because of its established craft brewing reputation, he said. Downtown Muskegon is home to Unruly Brewing Company and Pigeon Hill Brewing Company, both of which are in the process of expanding their production. “With Pigeon Hill and Unruly recognized as high quality breweries, people are already driving in - it becomes a tourist destination,” Rake said. A new brewery named after the historic building where it’s located is now open in North Battleford, Saskatchewan, Canadian Beer News reported on December 10. Armoury Brewing has been founded by partners Brennan Lampitt, Brad Taylor, Gregg Tady, Jackson Tady, and Wade Voigt, with Saskatchewan native Logan Dommett on board as brewmaster. Housed in the North Battleford Armoury building that was originally constructed in 1913, the brewery opened its doors last week and is currently offering five beers – Blonde Ale (5% abv), Light Brown Ale (4.5% abv), Dark Brown Ale (5% abv), S.M.A.S.H. Pale Ale (5.5% abv), and IPA (6.1% abv) – in pints, flights, and growlers. Armoury Brewing is located at 702 102nd St. and will be open 3:00 PM till 9:00 PM on Tuesday, 3:00 PM to 10:00 PM on Wednesday and Thursday, 3:00 PM to 11:00 PM on Friday, and 12:00 noon to 11:00 PM on Saturday for the month of December. Ongoing business hours and details of an official grand opening will be announced at a later date. Anyone who drives along Colorado Highway 72 knows that the road just south of the former Rocky Flats nuclear weapons plant can be a little windy at times, and somewhat desolate. But it’s also a linchpin between Golden, Boulder and other surrounding towns, and the empty land is filling in fast at Candelas, a 1,450-acre master-planned community that will one day include more than 2,000 homes and condos, Westword reported on December 13. And like everyone else in Colorado, the homeowners will need a place to drink beer. Resolute Brewing, which opened in Centennial in 2016, revealed this week that it's building a second location in Candelas, at the intersection of Highway 72 and Candelas Parkway, in the far reaches of Arvada. Niantic’s newest downtown night spot, the Niantic Public House and Brewery, has been an idea in the making for over a decade. Ledyard native Todd Sakowski has dreamed about opening it since he was a student, learning how to brew beer in his spare time at Eastern Connecticut State University, theday.com reported on December 9. Now, five years after that decision, Sakowski and his wife, Jenn, a compliance analyst at Electric Boat, made that dream into a reality when their brewery and pub house opened on Nov. 24. Built into the back warehouse of the former Mitchell’s Grocery Store behind Dunkin Donuts and the Spice Club in downtown Niantic, the brewery is wide and spacious, with high ceilings and a 50-foot bar that seats 25. A new brewery headed by three veterans of Calgary’s brewing and homebrewing scenes is now open in the city’s Barley Belt neighbourhood, Canadian Beer News reported on December 10. Cabin Brewing has been founded by brewer Jonas Hurtig who previously worked at Wild Rose Brewery, Haydon Dewes of beer news website The Daily Beer, and Darrin Sayers of the Cowtown Yeast Wranglers homebrew club. The brewery’s 45-seat taproom and retail shop opened this past weekend with beers including Super Saturation NE Pale Ale (6% abv, 40 IBU), Sunshine Rain IPA (6.7% abv, 60 IBU), Retrospectrum Pale Ale (5.2% abv, 40 IBU), and Lost & Won Scotch Ale (6.9% abv, 30 IBU) available by the glass, growler, and in cans. Cabin Brewing is located at 505 36 Ave SE in Calgary, and is open 3:00 PM to 9:00 PM on Monday to Thursday, 12:00 noon to 10:30 PM on Friday and Saturday, and 12:00 noon to 6:00 PM on Sunday. Hudson Avenue, long a sleeper stretch of an otherwise vibrant Midtown, is set to start coming back to life with the opening of Elk Valley Brewing later this month, NewsOK.com reported on December 9. What was last a tattoo shop attached to an aging and unrecognizable former theater and shell of an office building has been transformed into a tap room for Elk Valley Brewing. The roof is set to open this spring as an open air rooftop patio, while a two-story brewing room is home to a series of tanks that will produce Elk Valley's four main brands and a rotation of specials. Elk Valley Brewing was started five years ago by longtime home brewer John Elkins. Over the past five years, Elk Valley has shared space with other more-established brewers. The Midtown location at 1210 N Hudson Ave. popped up as the craft brewery community took off with laws that allowed for taprooms and expansion of hours from 9 p.m. to 2 a.m. closings. A plan hatched while in college became a reality for three friends who launched Spider City Brewing on SE Ninth Street in Bend, the Bend Bulletin reported on December 12. After a couple delays, Helltown Brewing has finalized its purchase of the Rivertowne Brewing brand and its production facility in Export, the Tribune-Review reported on December 13. “With this purchase, we are able to greatly increase production, including cans, of Helltown’s beer,” the company said on its website on December 12. The bankruptcy sale was finalized on Nov. 5, four days after U.S. Bankruptcy Judge Gregory Taddonio indicated that he would approve the revised sales agreement. Rivertowne Brewing filed for Chapter 11 bankruptcy in May after a plan to generate more revenue fell through. Mt. Pleasant-based Helltown Brewing and the Brewery Acquisition Co. were the successful bidders in October. The acquisition includes the Export building, all the brewing equipment and the Rivertowne brand name. It does not include the Verona or Monroeville locations, said Arnie Burchianti, majority owner and CEO. Helltown continues its operations in Mt. Pleasant and will resume production of Rivertowne brand beers once the brewery licenses for the Export facility arrive in January, Burchianti said. Renovations are planned for both locations. Limitless Brewing, Lenexa’s first brewery, is open for business. Co-owners Dave and Emily Mobley, Dave’s brother Steve Mobley and Darin Worthington opened the microbrewery and tap house at 9765 Widmer Road on Nov. 21. Emily Mobley said she and her husband, Dave, first got into the brewing business after touring breweries across the country for the past year and blogging about their experiences. That’s why the owners equipped the tap house with mostly community tables; the layout itself is designed to encourage strangers to sit together and get to know each other over a glass of cold craft beer. The menu has five craft beers, all brewed in house; Emily Mobley said they plan to grow the menu to 12 beers on tap in the near future. Pineville’s first brewery, under renovation construction and scheduled to open in February, is coming in hot, the Charlotte Five reported on December 13. Spanning two stories on the backside of the Golf Village building, Middle James Brewing Company will boast 24 taps, lunch and dinner 7 days a week, 15 TVs and a projector, an 830-square-foot room for private parties, a shaded deck overlooking the putting green, Par 3 and range and an outdoor beer garden. The brewery will be located at 400 N. Polk Street, just south of Interstate 485, in a building that was once a golf shop and then a darts and billiards hall. The space was empty for several years until business partners Michael Smoak, Andrew Viapiano and Shannon Wallace took over. With the addition of the new spot along the arterial road where Pineville meets Charlotte, the trio is determined to up the social game for nearby golf range visitors, car dealership service department customers or post-workout Crossfit athletes. Carlsberg will control 60% of Portugal's Super Bock after taking a stake in the beer group's owner. Denmark’s Carlsberg and India’s United Breweries have filed pleas with Indian authorities, seeking leniency in a probe into alleged collusion to fix beer prices, five sources familiar with the matter told Reuters. The Competition Commission of India (CCI) has been investigating the two companies, as well as the world’s largest brewer Anheuser-Busch InBev (AB InBev). Last year, as previously reported by Reuters, AB InBev told the regulator it had discovered an industry cartel that discussed and agreed on beer prices before submitting them to Indian states, which regulate pricing. The company’s confidential disclosure under the CCI’s whistleblower-protection scheme led to dawn raids by the regulator in October at offices of all three of the brewers. In recent weeks, both Carlsberg and United Breweries filed pleas under the CCI’s so-called leniency programme, submitting evidence and agreeing to cooperate, the sources said, adding that such cooperation could lead to a smaller fine if wrongdoing is discovered. A Carlsberg spokesman in India said it was “cooperating fully with the CCI” and had done so from the beginning of the probe. Mahou India, the first subsidiary of Spanish brewing major Mahou Group outside of Spain, has entered Bengaluru. The entry marks the launch of their portfolio which includes Belgian beer in wheat and lager category, the Economic Times reported on December 12. “We are thrilled to expand our presence to the beer lovers city of India i.e. Bengaluru. Our premium lager beers – Mahou 5 Star and Mahou Clásica have received a great response since their launch in the last three years in other parts of India and we are delighted to launch these products for the city. Mahou Maestra Wheat is the first wheat beer in India that comes with a pull-off cap in its pint bottle. Bengaluru, a city known for its beer culture, is a significant market for us,” said Fernando Bustamante, CEO of Mahou India that is headquartered in Gurugram (Haryana). Mahou India is a 100% subsidiary of Mahou Group, which is a Spanish-owned family company and market leader in Spain with a production share of 34%. The firm’s history dates back to more than 128 years, beginning with the birth of Mahou in 1890. Guinness Ghana Breweries Ltd says it is committed to increasing its local raw material sourcing from 50 per cent in 2018 to 70 per cent by 2020, Myjoyonline.com reported on December 12. Managing Director of Guinness Ghana, Gavin Pike, believes this new strategy will not just benefit over 175,000 farmers across the country but will also increase investment into Ghana’s local raw material. Mr Pike was speaking at the ‘Facts Behind the Figures’ session organized by the Ghana Stock Exchange in Accra. Gavin Pike said that even though the ease of doing business in the country has marginally improved, more seems to be done to deal with outstanding issues of high taxation and the volatility of the Cedi against major currencies like the dollar. AB InBev Efes has brought a first batch of U.S. craft beer by Goose Island Brewery to Ukraine, the Ukraine Open for Business portal said on December 12. “The company brought to the Ukrainian market world-famous American brands from the manufacturer of craft beer Goose Island Brewery: Goose IPA and URBAN WHEAT ALE. The first batch is 60 hectolitres,” the company said in a press release on December 11. Two brands by Goose Island Brewery are already on shelves in the Ukrainian MegaMarket, Novus and Silpo retail networks. As reported, the world’s largest brewing concern Anheuser-Busch InBev (AB InBev) and Anadolu Efes, the largest brewing company in Turkey, completed the merger of businesses in Russia and Ukraine in equal shares in late March 2018. 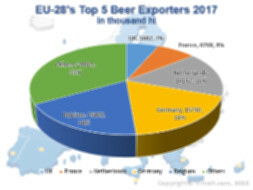 AB InBev Efes is one of the leaders of the Ukrainian brewing market, occupying 30.5% of it. AB InBev Efes in Ukraine owns three breweries in Chernihiv, Kharkiv and Mykolaiv regions. Some South African liquor outlets are apparently running out of Castle Lager beer, as a shortage of bottles affected production, Business Insider South Africa reported on December 13. Outlets in Cape Town appear to be particularly affected by the delay, Netwerk24 reported. Refilwe Masemola, South African Breweries director of external communications, said a shortage of reusable bottles has slowed the production process. There have been delays in returning these bottles to SAB, Masemola said, without giving more details. “Our production teams are [however] hard at work to ensure that those outlets that may be affected are well stocked over the coming days,” Masemola told Business Insider South Africa. Castle Lager is one of South Africa’s most consumed beers and was for the first time named the 25th most valuable beer brand in the world in 2018.